We are a leading Manufacturer of membrane filter, membrane filter holder bta with diaphragm valve gm valve, membrane filter holder (293mm) - std, membrane filter holder (90mm) - bta, membrane filter holder (90mm) - std and membrane filter holder (142mm) - bta from Thane, India. We are leading supplier of Membrane Filter. A built-in system for bubble testing can be provided with the membrane holders by in building a set of liquid air control valves. We are leading supplier of Membrane Filter Holder BTA with Diaphragm Valve Gm Valve. Design: Unipack Filter Holders are decorously designed to support the membranes against the applied pressure differential. Owing to our extremely talented team of professionals, we are engaged in offering excellent quality Membrane Filter Holder. Our complete range of filter holder is designed with top quality of material in accordance with the market norms. The offered filter holder is broadly applauded for its quality long life also examined on quality parameters for ensuring its flawless range. Clientele can purchase the whole range of filter holder at pocket-friendly rates. support the membranes against the applied pressure differential. a system for bubble testing can be provided with the membrane holders by in building a set of liquid air control valves. 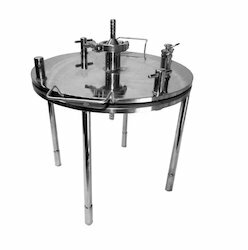 With our rich industry experience, we manufacture, export, distribute and supply an extensive range of Membrane Filter Holder Bta with Diaphragm Valve. At our developing unit, we design this filter holder as per the international standards by making use of best quality basic material and latest technology. The offered filter holder is perfectly examined in terms of quality for ensuring their flawlessness. Along with that, customers can avail the complete assortment of filter holder at the nominal price. We are leading supplier of Membrane Filter Holders. Looking for Membrane Filter Holder ?